"In this elegant dessert, a crisp white meringue layer is filled with whipped cream and fresh fruit. To keep your meringue from being flat and grainy, try beating egg whites until stiff but not dry. Overbeaten egg whites lose volume and deflate when folded into other ingredients. Also, when beating in sugar, beat in about 1 tablespoon at a time, beating well between each addition. Then beat until meringue is thick, white and glossy. Be absolutely sure not a particle of grease or egg yolk gets into the whites." Bake for 1 hour. Cool on a wire rack. In a small bowl, beat heavy cream until stiff peaks form; set aside. Remove the paper, and place meringue on a flat serving plate. 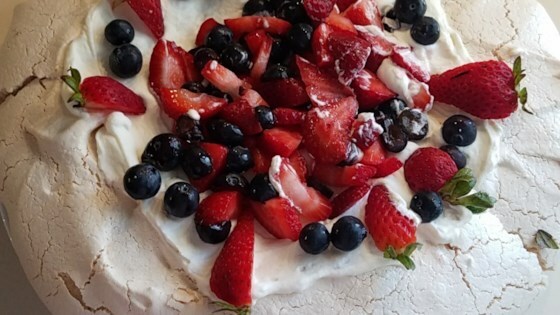 Fill the center of the meringue with whipped cream, and top with kiwifruit slices. Crisp meringue layer topped with whipped cream and fresh fruit. Other fresh fruit may be substituted for kiwi, like sliced strawberries, pineapple, mango, or a combination thereof. If you prefer sweetened whipped cream, you may add two teaspoons of sugar while whipping the cream, or to taste.